Question: If there are 100,000 teachers in Michigan, what is the probability of being named the state’s Teacher of the Year? Answer: The probability cannot easily be calculated because one needs to factor in the countless different qualities that make a teacher outstanding. If you want to do the straightforward math, East Kentwood High School teacher Luke Wilcox can help. If you want to understand all those other factors, just watch him teach. 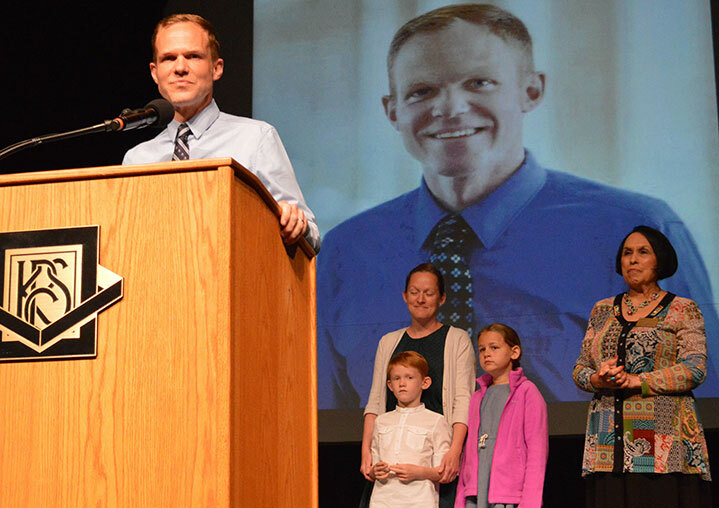 Wilcox was named Michigan Teacher of the Year by the state Department of Education Tuesday at a surprise assembly attended by colleagues, students, and his family: wife, Jamie, and children Reese, a third-grader, and Trey, a kindergartner. State Superintendent Brian Whiston announced the award. “I had no idea. It was such a crazy surprise to me; I was very overwhelmed. I got emotional,” said Wilcox, who was also a finalist for the MTOY award in 2015. Wilcox helps his students – all of them – understandnumbers and how they work. But in a black-and-white world of data, he recognizes the nuances, the shades of gray present in each and every student who sits in front of him. He gets to know what makes them tick, what makes them connect, and that’s how things add up to produce his great teaching results. 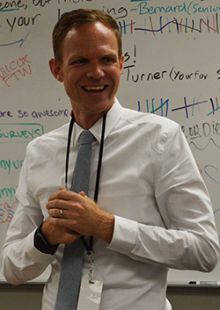 It’s almost like Wilcox creates a customized plan for each student in his Advanced Placement Statistics class, all with the common end goal of “Strive for Five.” That means earn a top score of five on the AP exam. He suggested cutting down her hours at work and gave her advice for making more time for school. What Makes a Teacher of the Year? It’s 8:40 a.m. on a Wednesday and Wilcox has already been at school for nearly four hours. He arrives at about 5 a.m. every morning to write a teachers’ edition of an AP statistics textbook and work on his website, TheStatsMedic.com (geared toward helping math teachers become more comfortable teaching statistics). He often stays after the final bell to meet with teachers in his Rising Teacher Leaders group, which he started last year to help new teachers learn the ropes. 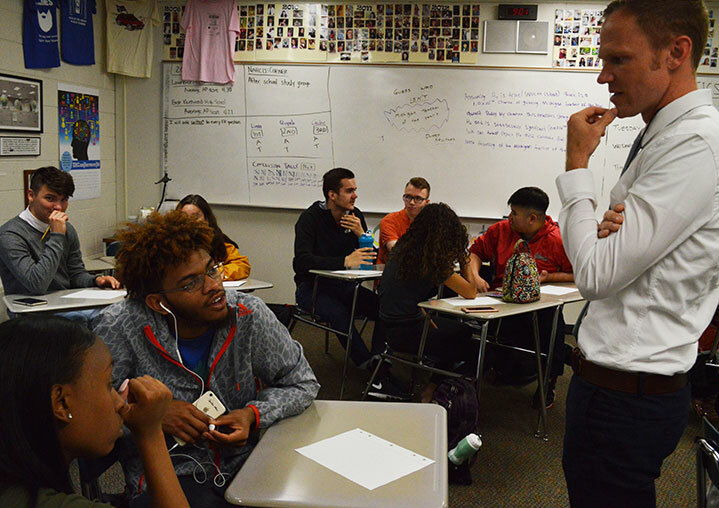 It’s the day following the Teacher of the Year ceremony, and instead of math, Wilcox gives his AP statistics class a writing assignment: Share the story of your education up to this point. It’s safe to say Wilcox might get a mention or two in his students’ pieces. Besides writing math books and empowering other teachers, Wilcox teaches statistics in a way students grasp. His track record of getting them to know the material is near-perfect. In the last 10 years – if you look at cumulative results – he’s had a 97 percent pass rate for AP exams. It’s just about so much more than teaching math, he explained. Wilcox has taught Algebra 1, Geometry, Pre-Calculus and AP Statistics at East Kentwood High Schools since 2001, and has served as Math Department chairperson for the past several years. Still, he had teachers and counselors at Northville Public Schools on the east side of the state who inspired and motivated him. He excelled and enrolled in the School of Engineering at University of Michigan after graduating. He soon switched to the School of Education. East Kentwood High School is the most diverse school in the state, where students from more than 60 countries walk the hallways. They are the reason, Wilcox said, that he gets up every day. For him, the Teacher of the Year award is really about them, each and every student. Wilcox also serves on the School Leadership Team, helping grow teachers as leaders. “What makes Luke especially outstanding is not only what he does inside the classroom but what he does in the whole building,” said fellow math teacher Jenin Shamali. “He inspires us to be better teachers. “He motivates us to work hard. He works so hard that it makes me want to work harder to match up,” said math teacher Lindsey Gallas. This is not his first recognition; Wilcox has also won the prestigious Presidential Award for Excellence in Mathematics. East Kentwood High School was named a state Priority School four years ago, ranking at the 4th percentile, meaning 19 out of 20 schools in Michigan were deemed better. In 2016, however, the school leapt to the 49th percentile, and Principal Omar Bakri said much of that has to do with Wilcox. Improvement required systemic change, collaboration and bringing everyone on board. Superintendent Michael Zoerhoff said Wilcox embodies the best of Kentwood. 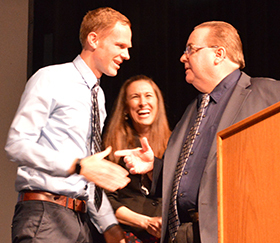 “He’s been our Teacher of the Year for many years,” Zoerhoff said. “He’s very well-deserving. He fits into what we do in Kentwood very well. He models that growth mindset and Kentwood grit to create excellence. Wilcox said the award is bigger than him, and belongs to the whole community. 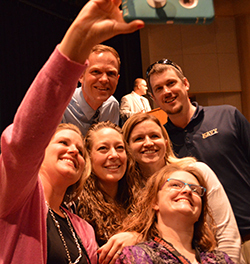 Because of that, he sees his Teacher of the Year role as an opportunity to continue to serve his district and beyond. In a political climate where public education faces threats, and decisions are often made by politicians who have never worked in education, Wilcox wants to provide a real look at what happens inside schools. He also wants to be the voice of the disadvantaged student and what’s needed to provide equity in education. As Teacher of the Year, Wilcox will have more chances to reform, motivate, inspire and get people talking about what is needed in public education. So, what is the probability he will impact thousands upon thousands of teachers and students, all while giving them a voice?